Public relations is more than getting media coverage; it’s the strategic crafting of a corporate image, or the skilled presentation and introduction of a person, non-profit, or product to the media. From publicly held start-ups and non-profits to inventors to publishers and experts in various fields, Smith Publicity is experienced at utilizing the media to achieve key objectives and establish long-lasting, positive reputations. 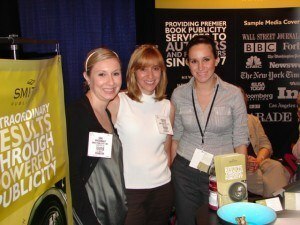 Our diverse experience in the fields of marketing, publicity, and public relations make us a very unique book publicity agency. Smith Publicity has helped a wide range of experts expand their national name recognition via carefully structured public relations campaigns and online PR services designed to make them “go-to” people for the media. Watch virtually any national news feature television show or read in-depth articles exploring specific subjects, and you will inevitably find experts interviewed and quoted. We coined the term “personality cultivation” because it perfectly matches our public relations campaign strategies. Typically “warming up” our client-experts with local and regional media, we groom them in a fashion to which the media responds, slowly moving to larger media. We accentuate all that makes them unique and we don’t stop until the media starts calling us and the cumulative effect of our platform development has established the expert as the leader in their field. Marketing and advertising can get a company or organization name “out there,” but effective public relations, online PR services, and the resulting media coverage provide the credibility and positive perception that makes the difference. As a book PR agency, we don’t endeavor to simply get news coverage for a company; we tell a company’s story in a compelling, newsworthy manner. It’s easy to send a press release about a new product, but actually developing a positive public image requires the skilled, nuanced, media relations skills of Smith Publicity. Imagine the benefit a client, a non-profit organization focused on educating people about medical mistakes, received when its story was the feature article on the cover of Parade magazine. Smith Publicity made this happen and propelled the organization to national recognition. Non-profits benefit from the fact that they provide a valuable service to the public, and aren’t selling products for profits. At Smith Publicity, we capitalize on this and focus on promoting human-interest elements and telling persuasive, interesting stories about non-profit organizations.